Will the Moon Goddess’s Prediction come true? Thorn Moonwalker, King of the moon elves is traveling the universes seeking his Radiance, she who will mend his heart and save his people. The Moon Goddess has predicted Ciana Walker is his radiance. If he can win her heart! 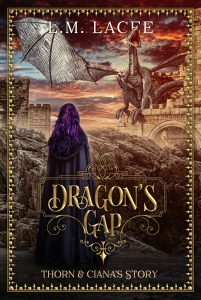 Striking a bargain with the Moon Goddess was never on Thorn’s agenda but now he must take his warriors into the unknown lands of earth to fulfill a quest and secure the love of his life at Dragon’s Gap. This was a time consuming book to write. Not for the obvious reason of so many story lines or characters or leads into the final book. No! What took the time, was finding Ciana. She persisted in hiding her voice from me it was very disconcerting I mean really who does that! Eventually I wore her down and she started talking to me and we got on with the story. I am not sure if it was the thought of motherhood or finding her dad or having a jailed Elf for a mate. Truthfully anyone of those plot lines could have caused her to be reticent in helping me tell her and Thorn’s story, of course it could have been the Goddesses trying to halt the fact they were a little lax in their care of Ciana’s sister.